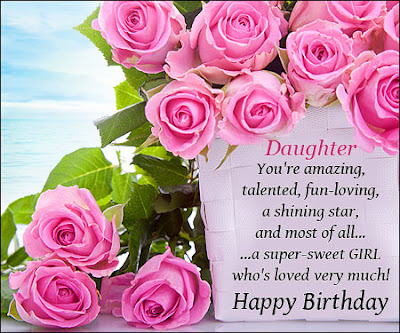 Happy Birthday, Daughter: Need some good Birthday wishes to send to your daughter, Here we have a collection of Beautiful Birthday messages which can be helpful to you. You can Share these Birthday wishes with your daughter via Text/SMS, email, Facebook, Whatsapp, IM, etc. Daughter, there is no obstacle you cannot overcome in life. You are driven and determined, and there is absolutely nothing you cannot do once you set your mind to it. Words cannot express how unbelievably proud I am you.. Happy birthday, my dear daughter! You brighten my day and warm my heart whenever I look at you. And as you celebrate your special day, know that I will always be there for you whenever you need me..
My daughter, I will never stop being concern for you and praying for your success and happiness. Wishing you all the best on your birthday!. Your birthday is the perfect time to celebrate how truly phenomenal you are. You are classy, beautiful, and intelligent. How I produced you, I do not know, but I am so thankful!. Happy birthday to my darling daughter! You are unbelievably precious to me, and I hope you realize that you are my everything. May your birthday be filled with splendor and love.. Your very existence has brought beauty and grace into my life. I hope you know that when you were born my soul was touched in a way, I never thought possible. May your birthday be half as marvelous as you are..
Daughters as amazing as you are one-in-a-million. How I lucked out I will never know, but I plan on spending the rest of my life being so grateful that I have you in my life..
You give me a thousand more reasons to smile every blessed day. Happy birthday to you my beautiful daughter! May your life always be filled with happiness!. Being your mom, it the greatest joy and adventure. I wouldn’t trade it for anything else in the world!. I never knew I could love something so tiny so much, but the day you came into my life I was overwhelmed by all the love I had for you. Thank you for showing me how wonderful being a parent is. Happy birthday to my darling daughter!. You may have outgrown our laps, but you will always be our little princess. We love you more than life itself. Have a happy birthday!. Dearest daughter, may you always locate your North Star and may it always guide you towards happiness and success. I will be waiting at the finish line to celebrate your success with you! Happy birthday..
From the day you first came home from the hospital, you ruled our house like a tiny little tyrant. Now, on your birthday, we get to treat you like the queen you are. Happy birthday from your loyal subjects a.k.a. your parents!. Thank you for being such a wonderful and sweet daughter to me. May all your wishes and dreams come to pass. Happy Birthday, dear daughter..
Our beloved daughter, we just want to use this special day to say a big thank you for filling our lives with immense joy. May you have a great birthday celebration. We pray that happiness and love surround you always..
May you always stay as gleeful and bold as you are now, my daughter. 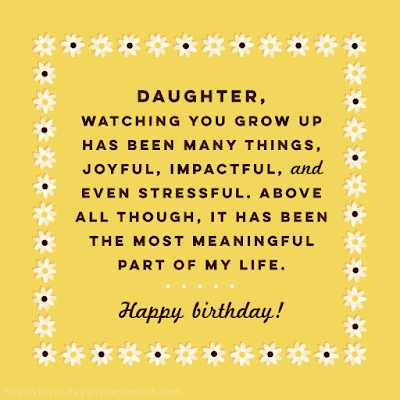 I hope that you carry your zest for life and adventure into adulthood and that your days are filled with love..
My dearest daughter, you are not only the air that I breathe but also the beat of my heart. I love you more than you could ever imagine! May you have the happiest birthday ever!. A princess should be treated like royalty. You are the birthday princess. I hope you get every good thing you desire.. I love celebrating your birthday every year because it is such an excellent reminder of how grateful I am that you were born. I cannot imagine a better daughter than you, and I am glad I don’t have to..
My daughter, I wish you love, joy, happiness, and all the positivity in the world on your birthday..
Dear daughter, I wish you a lovely birthday. May happiness and beauty envelope you on this special day of yours and always..
Can’t believe you’re another year older. I wish I could slow down time. Happy Birthday..
My big girl, I don’t think it’s possible to love someone as much as I love you. Have a very wonderful birthday.. I really wish I could be there for your birthday. Know that no amount of distance could ever dull my love for you. I am sending happy thoughts and lots of love your way for your birthday.. Happy Birthday, Princess. Mom and dad.. Daughter, this may have been a rough year, but I know that only happy things are coming because a daughter as splendid as you deserves every joy in life. May your birthday mark the start of a wondrous year for you..
You are such a positive, charming, and absolutely adorable daughter. I am so proud that I get to call you my daughter because no other person could ever hope to compare to you. Happy birthday to my perfect little girl!. Of all the presents I have ever been given in my lifetime you were the most beautiful gift I have ever received. Your presence in my life has added nothing but value and joy to it.. This year for your birthday I plan on indulging your every whim, and when I say whim, I really mean bribing your affection with chocolate! Here’s a good life lesson, there’s nothing chocolate can’t fix..
Another year has come by and you are not only older but prettier and smarter. Our darling daughter, we pray that all your dreams come true. Have a happy birthday. We are proud to be your parents..
Best wishes for you. Best birthday kisses for you. Happy birthday, daughter..
Not only are you a wonderful daughter to me, but you are also a great mother and wife. Today, as we celebrate your birthday, I hope all your wishes come true – not only on this special day, but every day of your wonderful life. I am so proud to call you my daughter!. We are so proud to call ourselves the parents of such an amazing daughter like you. We wish you a very happy birthday! May all your dreams and aspirations come true. We love you!. The depth of your kindness and love influences, not only my life but the lives of everyone you meet. You are such a compassionate and caring person, and I am so grateful I have such a splendid daughter.. Ever since you were born, you’ve always possessed the unique talent of lighting up the room. Keep that birthday glow forever. Love always..
Congratulations on your Big day, dear daughter! May this remarkable day of yours be filled with nothing but laughter and happiness.. Happy birthday to my favorite daughter! Yes, you are my only daughter, but that’s just because you were so perfect I didn’t need to have another one. Great job on being awesome.. Happy birthday to the sweetest and most glorious daughter on planet Earth! Sweetie pie, you make me happier than when I look at my alarm clock and realize I have more hours to sleep!. You are such a positive and loving person, daughter. You must have gotten that from your mother! Just kidding, but please know that I am so delighted to have such a magnificent daughter..
Have a happy birthday, my little princess. I love you more than a greedy cat loves food. And that means a lot!. To the birthday girl, remember that you are treasured above all others in my eyes. I love you so much..
Let every gift and birthday wish be sincere and bring you so much joy. Smile and be merry on your beautiful birthday..
No matter how old you are, you will always be my sweet little bundle of joy. Have a wonderful birthday!. Daughter, time seems to have flown by. Just the other day you could barely stand, and now I get to watch you run the world! Watching you grow up has been such a joy, and I know that only greatness lies ahead for you. May your birthday be just as spectacular as you are..
Before you were born, I wasn’t sure what to expect, but now I know exactly what to expect: to give more than I ever have, to care more than I ever did, and to love more than I have ever thought possible..
Here’s wishing that your life has so many more moments of happiness than those of sorrow. We can start with this moment: the moment I tell you “I love you.” Happy birthday, my love!. I hope your birthday is filled with balloons, presents, and cake. More importantly, I hope it is filled with love, joy, and warmth. May your every wish come true this year. Happy birthday!. You are the coolest and most adorable princess in the world. We love you so much! Wishing the sweetest girl in the whole world a very Happy Birthday and a great life ahead!. You will always be our little sunshine. Happy Birthday!. A daughter as sweet and loving as you is hard to come by, and I am so fortunate that I was blessed with a wonderful daughter like you. May your birthday be filled with lots of presents and cake..
Whatever I did in my previous life must have been really incredible to have someone as wonderful as you as my daughter in this lifetime. Happy birthday, sweetie! I will always love you and be there for you..
What really matters most in our lives is you. To us, you are more valuable than all the wealth in this world. Happy birthday, our wonderful daughter! May you be happy always..
Dear Daughter, watching you grow has been a pleasure. I don’t want to let you go but, because I love you, I must let you go and be the responsible adult that I know you are. Happy Birthday..
Every ounce of time, money, and dedication that I have invested into you and your future is worth every bit. I am reaping the returns on those investments every day. Happy birthday, from a proud father.. Daughter, I want you to feel invincible on your birthday because you are. There is no hardship you cannot endure, no hurdle you cannot jump, and no barrier you cannot break. Happy birthday to my little champion!. Never give up in life. No matter how tough the challenge is, keep on trying. You might fail once or multiple times, but never give in. Keep on fighting for what you want, and you’ll finally succeed in the most outstanding way possible. Have a beautiful day.. Daughter, every day you continue to amaze me. You are such a confident, cute, and caring daughter. May your birthday bring untold bliss and happiness this year..
You will always be our little princess. But today, you have become a mature queen. You mean the world us! Happy Birthday..
You are a lot like a diamond: brilliant, amazing, and flawless. You differ in that you are worth far more than any stone. You are such a treasure, not only to me but to our whole family. Happy birthday to our precious gem of a daughter!. At first, I wasn’t sure how to be a parent to a daughter, but now I can’t imagine a life that doesn’t include you. You fill my heart and soul with peace and love. May your birthday herald the beginning of an astounding life for you..
Whatever you want in your life, you can achieve it because in you, I see a great achiever. Happy birthday to you, my beautiful angel.. Happy Birthday to you our beloved daughter! You are the most precious thing in our lives. May your life always be filled with love and happiness.. I wish you only the best of luck in all you choose to do in life. Since you are strong, capable, and hard-working, I am sure nothing will be too much of a challenge for you though!. Dads are a lot like beacons, and daughters are a lot like ships; my job is to light your way home. Especially, when you are dating. I hope it comforts you to know that if it is past curfew, you can always count on me to show you the way home!. I wish you unlimited happiness and joy in your life because whenever you are unhappy, it just breaks my heart. Know that I am always here if you need me. Happy birthday!. May all of your dreams and wishes come true on your lovely birthday..
Life comes with many blessing and many trials and tribulations. You are one of those many blessings. Have a very blessed birthday.. When you were a child you wanted a pony for your birthday, when you were a teen you wanted Johnny Depp, and now that you are an adult you only want love and affection. Finally, something I can actually provide! Happy birthday to my daughter who is all grown up!. You always amaze me with your ability to give unconditionally. If there is one thing that I have to give you unconditionally, it would be my undying love. To the ends of my days, you will always be truly loved and treasured.. The day you came into this world was the day I was blessed with a bundle of happiness and joy. You have brought more tenderness and purpose into my life than I ever thought possible..
Now that you’ve grown up, you may be too cool to come home for your birthday. That’s okay because we’ve decided this year to come visit you! Seeing you: check. Loving you: check. Opportunity to shame you in public: priceless.. Daughter, you’ve got it all: talent, spirit, and drive. Heck, if you weren’t my daughter I might hate you just a bit! Luckily, you are my daughter, so I love you to bits and pieces!. You have so many roles in life: friend, confidante, and muse. None as important as being my beloved daughter. If you ever feel overwhelmed by life’s demands just turn to me, and I will carry your burdens just like I carried you as a child.. Happy Birthday! I'm so proud of you and will always be by your side no matter what!. Daughters are a gift from heaven and you are no exception. Have a happy birthday, my little angel.. Happy Birthday, daughter. You make our life sweeter and brighter – and that’s one extra reason to wake up in the morning..
Dear daughter, you are responsible for making everything about my life better and sweeter. I just hope that I can make you as happy as you make me. Thanks for being such a sweet daughter. May all your heart’s desires come true! I love you! Happy Birthday!!!. Facing challenges is one of the most inevitable things in life. However, letting your challenges defeat you is one of the most optional things in life. Never surrender to the obstacles that confront you in life. Happy birthday, dear.. The #1 daughter deserves the #1 birthday treatment. Enjoy your lovely day..
Every moment spent with you has been an absolute joy. You fill my days with laughter and my thoughts with love. May your birthday be as unforgettable as you are..
I’m proud of you because you never give up on your dreams, and that takes an extraordinary amount of determination and perseverance. Happy birthday.. I am nothing short of delighted to have such a funny, sweet, and caring daughter. You enrich my life in too many ways to count, and I hope your birthday is just as special as you are.. I know that you are so excited to be getting older, but I promise that if you just wait a bunch more years that feeling will pass! Enjoy every moment of your childhood, because it is a truly special time in your life. Happy birthday, munchkin!. As you’ve grown, you have taught me so many things in life. Over the years you’ve taught me to have endless patience, unlimited affection, and eternal love. Happy birthday!. Happy Birthday, daughter! We love you and believe in you..
Dear Daughter, stay beautiful and always stay my little sweet girl. Wishing you tons of good, sincere birthday wishes.. Happy Birthday to our sweet little princess! May your birthday be as wonderful and as sweet as your smile! We’ll always love you!. Daughter, you have grown into such an amazing woman. You must have gotten that from me! Thank you for making it so easy to be proud of you. Happy birthday, my angel!. You bring fun, laughter, and joy into my life. The day you were born was the day that lit up my world. I hope that on your birthday you can feel just a measure of how much happiness you have brought into my life.. I hope that when you are older, you have a daughter so you can feel the depth of my love for you. Also, the depth of my stress, anxiety, and worry! I look forward to the glorious payback of watching you struggle through parenthood. Of course, always with love!. You can accomplish whatever you want to accomplish in this life. All you need to do is believe in yourself. I have so much faith in you, my dear. Have a positively beautiful birthday.. When I first held you in my arms, I knew in that moment that I would love you forever. You are such a beloved part of our family, and I hope your birthday is filled with happiness and love.. I smile every day because you are my daughter. Words are not enough to express how much you mean to me. Happy Birthday, my lovely daughter!. When I first heard I was having a daughter I was scared, but after all this time I am so very grateful. There is no moment I would ever discard because every moment spent with you is as unforgettable as it is valued.. When you were little, you were never afraid to give me tons of kisses, but now you seem so embarrassed! As a parent, it is my duty to embarrass you as much as possible, so this year I plan to smother you with hugs and kisses in front of all your friends. You are so welcome..
Life is the most beautiful thing in the universe. Enjoy every single second of it to the fullest. Happy birthday..
Never let anything stop you from chasing after your dreams, for life is too short to wait for your dreams to come knocking on your door. Happy birthday, sweetheart.. There are not enough words in the English language to express all that I feel towards you, daughter. 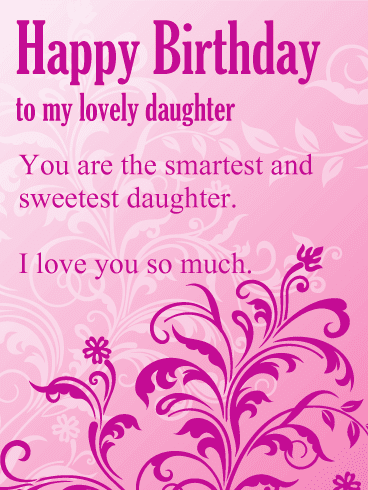 If I had to, I would go with “I love you so much.” Happy birthday to my truly loved daughter!. Wishing a fabulous birthday celebration to my precious daughter. Sweetheart, I will always stand by you come what may because I believe in your dreams and your ability to achieve them.. I don’t know how such a small little girl can generate so much energy, but I do know how she creates so much happiness in my life, by being the most adorable, lovely, and amazing daughter ever!. There is one thing you’ll never stop doing in your life – filling my heart with immense joy. 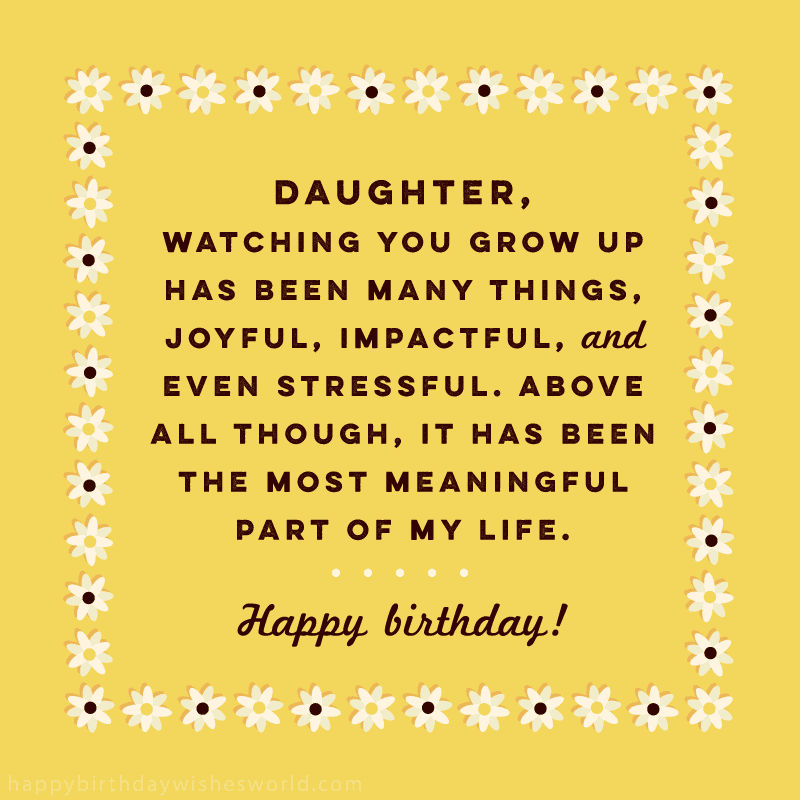 Wishing the most marvelous daughter in the World an extraordinarily Happy Birthday! May all your dreams come true!. When you were a little girl, you enchanted me with your antics, but as a woman, I am stunned by your grace and love. I am so fortunate that I brought such a truly wonderful person into this world..
A big part of who I am today is because of you. You continually inspire me to try harder, challenge me to be a better parent, and always love me unconditionally. Thank you for always bringing bliss into my life. Happy birthday!. Daughter, you are just like a Disney movie: you fill my life with magic, wonder, and delight. I hope you never stop wishing and dreaming because you deserve every happiness in life. Happy birthday to my little princess!. Life is extremely short, my sweet angel. Spend every moment of it doing things that put a smile on your face. Happy birthday..
Have an awesome birthday, my sweet daughter. You are growing up so fast and soon you’ll become an adult, but always remember that no matter how grown up you are, you will always be Daddy’s little girl.. I feel like I blinked and time flew by. It seems like just yesterday you were learning how to walk, and now you are running straight toward all that life can offer. I am so proud of the phenomenal person you have become..
As parents, we never really reaped the benefits and rewards of love until you entered our lives. We wish you a happy birthday from the bottom of our hearts.. They say that you can’t be a mother and a friend to your daughter at the same time. I say the heck with that rule. You are my daughter and the best friend that I’ve ever had. I will never take our closeness for granted. Enjoy your birthday celebration..
Have a happy birthday, my daughter. Today, I celebrate and rejoice in the wonderful person you have become.. The day you were born was the greatest moment of my life. I am so grateful that I have a daughter as honest, beautiful, and intelligent as you. Happy birthday to my baby girl!. Happy birthday to my beloved daughter who deserves only the very best on her special day. I promise you that I will devote the rest of my life to providing you with unlimited love and affection..
You are the kind of person who radiates kindness and warmth. You light up the world around you, and you continually dazzle me with your love. May your birthday sparkle just as much as you do.. Daughter, you seem to have grown up magnificently. I definitely will take all the credit for that! Just kidding, but I am so very proud of you. I hope your special day is filled with tons of presents, cake, and lots of laughter.. Even though life seems difficult right now, just know that good times are around the corner. Just like your birthday, all things must come and go; and just like your birthday, they will bring about better things to come..
You are a lot like a diamond: brilliant, amazing and flawless. You are such a treasure, not only to me, but to our whole family. Happy birthday to our precious gem of a daughter!. Daughter, if you are lost in life just take a step back and remember your teenage years. Think back to 98 Degrees and just “Be True To Your Heart.” Yes, that was a cheesy 90’s reference, but don’t pretend like you didn’t love them! (I remember that poster.). Wishing my little angel a fabulous Happy Birthday! May your day be filled with sweetness, wonderful surprises and fun!. I hope that one day you are blessed with a daughter of your own because nothing can compare to the love a daughter brings into your life. I also hope she brings angst so that you can feel grateful I managed not to kill you in your teenage years! Just kidding, but maybe not.. There were times when I thought I would never get over the struggle of raising a teenage daughter, but luckily we both survived! The moments of angst were worth it though, because you are the best thing that has ever happened to me.. Happy Birthday daughter. My love for you is beyond words.. The day you were born you stole my heart, and you haven't given it back since. Hope your birthday is filled with joy and love. Happy birthday to my little thief!. Living a truly happy and prosperous life is simple. All you need to do is delete any negative thoughts from your mind and replace them with positive ones. Happy birthday!. Happy Birthday, sweetie. You brought more laughter to our lives than most get in a lifetime.. I hope your birthday is filled with great things: a great party, great food, and great people. You deserve it all because you are a great daughter. Happy birthday!. Daughter, I was trying to think of the perfect gift to get you this year, and then it hit me: I will watch all five Twilight films and not make fun of Edward even once. You’re totally welcome.. I look back at all of our mother-daughter moments with such fondness. From painting our nails, doing our hair, talking about boys, to watching you become a mother yourself, I have never been more proud of you.. Happy Birthday to our dearest daughter! We are so proud you turned into a beautiful and intelligent woman. We hope you have the time of your life on this extra special day of yours!. Daughter, I wish only the best for you in life. May you overcome every problem life throws your way, and may you always be confident in the face of adversity. Happy birthday!. Daughter, you’ve achieved so much in life, and I’m nothing but proud of the woman you’ve become. May your year be filled with continued success and never-ending love. I’ve got that love part covered!. Daughter you remind me of your birthday cake; you are full of sweetness and sprinkle my life with love. Happy birthday!. One of the best moments of my life was when you said you were proud to call me Dad. Those words shot straight to my heart and melted it. I hope you know I love you so much and wish you eternal bliss in life..
Hey, you know you’ll always be our little princess! Just keep in mind sometimes the crown will be taken, and you might have to queue. Happy Birthday!. Since hard work never goes unrewarded, I’m 100% certain that all your sweat and toil will yield nothing short of outstanding results. Happy birthday.. Daughter, you are better than fame, money, and even sliced bread! You are truly a phenomenal human being, and I plan on telling you so every single day until the end of time. I hope your year is as stupendous as you are..
You deserve the star treatment on today and every day. Have a wonderful birthday.. Whenever I am feeling down in life, I just think of you, because your smile lights up my life. Happy birthday to my vivacious daughter!. Daughter, know that when I was strict with you, it was because I loved you. It is in that spirit that this year for your birthday I have decided you may never, EVER date. This is done with love! Happy birthday to my future spinster!. If you always strive to do your best, I know that nothing will ever hold you back in life. You are passionate and caring, and I know that you are destined for a life filled with glee and love.. In all this birthday madness and party craziness, remember that you are the reason we celebrate on today. Enjoy your special moment..
Every time that I think that you couldn’t possibly get any better as a daughter, you do. Thanks for always amazing me with your brilliance and love. Happy birthday to my perfect daughter!. With self-belief and perseverance, you can overcome obstacles higher than Mt. Everest and deeper than the Atlantic Ocean. Never forget that. Happy birthday..
My sweetheart, you’ll never know how much you make daddy’s heart glow with pride and joy. Happy birthday to you..
As you’ve grown over the years you’ve changed in so many ways; all of which were for the better. I couldn’t be more proud of the person you’ve become. Happy birthday to my exemplary daughter!. It’s hard to believe you now have a family of your own. Seems like just yesterday when you were sitting on our laps! While we fondly miss those days, we can take solace in the fact that you have grown into a magnificent woman who always feels our hearts with pride. Happy Birthday, dear daughter!. Your curiosity inspires me, your daring emboldens me, and your love warms me. Happy birthday to a truly superb daughter. May your birthday be filled with everything nice in the world..
Knowing that I am loved by you is one of the best feelings in the world. 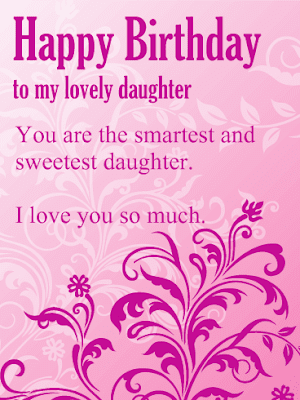 You are such an exceptional daughter, and I hope your birthday brings you everything you could ever wish for.. I know that at the end of my lifetime I am going to look back and think: my daughter is the greatest thing I have ever created. I am truly blessed to have such an amazing person in my life.. Daughter, life is an incredible journey. While I hope you never falter on your path, if you do, know that you can turn to me. I will always be there to show you unending support and love. Happy birthday!. I am so proud that I have the privilege of calling myself your parent. You are truly a delight as a daughter. Happy birthday to my perfect angel!. Many people have daughters, but only a few people are fortunate enough to have daughters that are indisputably perfect. It must be hard to be that perfect, but you make it look so easy. Happy birthday to the world’s best daughter!. Daughter, always remember to just be yourself, because there is no one more awesome than you! Thank you for filling my life with love, laughter, and countless adorable moments.. When you are sad, I am sad; and when you are happy, I feel untold joy. Every parent wishes their child to know only peace and happiness in their life, and I am no exception. May your birthday herald a year of great health and happiness..
You have grown up to become such a remarkable woman and mother. I am proud of you. This is your special day and we hope you have all the fun in the world. Happy Birthday, our dearest daughter. You are indeed our biggest blessing from Heaven.. I have so many wonderful memories of you playing house, dressing dolls, reading books, and learning how to dance. As you grow older, I comfort myself that there are so many more wonderful memories to come.. Happy birthday to my sweet little princess. Thank you for coming into my life and filling it with happiness. I love you from the bottom of my heart..
You are truly the love of my life, dear daughter. May all your desires be fulfilled on this special day of yours! Happy Birthday!. It’s not that I forgot your birthday, it’s just that mentally I was resisting you getting older! I love you tons, and I wish I could keep you forever as my baby girl. Happy belated (but just as sincere) birthday to my timeless daughter!. Dear daughter, despite the fact that you have grown into a wonderful lady, you will always remain our little angel. Wishing you a very happy birthday! We hope you enjoy your special day to the fullest..
Best birthday kisses for you. Happy Birthday, my daughter!. As a parent, my greatest desire is for you to be happy, healthy, and successful. Live a life that is filled with honesty and integrity. Know that there are no challenges that are too great for you to conquer. And, most importantly, please always know that I am only a phone call away.. I hope you know that you will never be too old to come home and be pampered like a princess. Too embarrassed, yes, but never too old! May your birthday be filled with lots of indulging in goodies this year.. In the course of chasing after your dreams, you’ll definitely be hampered by a number of obstacles. When that time arises, you can either give in or stay the course. Choosing the latter is harder, but at the end of the day it will lead to success greater than you ever imagined. Happy anniversary..
Cake, presence and birthday wishes for you, my girl. But it’s never truly enough to express my gratitude for having you in my life.. Happy Birthday! You are such a great person, I feel proud, grateful and blessed for having a daughter like you!. You are just like a rare unicorn: majestic, magical, and colorful. Okay, so maybe not magical or majestic, but you definitely have a colorful way with words! Happy birthday!. I still remember all the nights we spent just staying up talking and eating ice cream. If you ever need an ear to listen just turn to me, because you will never be too old for girl’s night with your mom.. When you were little I was your Superman; you thought I was so strong and could do no wrong. Now that you are grown, you have become my Wonder Woman; you are strong, brave, and capable of amazing feats. Happy birthday to my superhero!. I hope I have taught you everything you need to know to sail through life. I will always be here to support you through your journey and in all that you do. Wishing you a bright future and a very happy birthday.. Daughter I wish only the best for you in life. May you overcome every problem life throws your way, and may you always be confident in the face of adversity. Happy birthday!. I am thankful for the day you entered into my life, these days I get to spend with you, and the days to come. Looking forward to watching you continue to evolve into a graceful, smart young lady.. I couldn’t think of any better reason to celebrate. What a wonderful occasion. Happy Birthday to my amazing daughter!. Nothing gives me more pleasure in life than to be able to bring a smile to your face because your smile makes my heart sing. May your special day be filled with lots of candy, cookies, and cake.. Happy birthday to my favorite girl. You are my world!. The relationship between a mother and daughter is an exceptional one; it’s the kind of bond that lasts a lifetime. No matter your age, you can come to me with any worry, hope, or dream. I will always be there with a kind word and a warm hug.. I hope you know that it doesn’t matter how old you get; you will always be daddy’s little girl. You can still come to me, and I will love and support you no matter what. Happy birthday, sweetie!. There are many things I wish for you in life: success, good health, and fortune are just a few. But there is one thing I wish for you above all others, to know the joy of having a daughter to smoother in love..
Sweet daughter, hold on a little bit longer, for an incredible life full of happiness, smiles and prosperity awaits you. You are such an amazing inspiration to us, your parents. Happy birthday.. When my world feels dark, you are a ray of sunshine. Thank you for always being such a bright and shining person. May your special day be just as brilliant as you are.. Happy Birthday, our little angel! On this special day of yours, we want to remind you once again of how much you mean to us. Our love for you will never end!. Happy birthday, my wonderful daughter! On this great occasion, I wish you all the best. You will always mean the world to me..
We are forever grateful to have a daughter like you. You are the most precious thing in our lives. And even though today you are grown and have a family of your own, to us, you will always be our precious little daughter. We wish you a very happy birthday!. As you grow older and take on more responsibilities, we know you get very busy. So on this day, we feel so blessed to be graced with your presence. We wish you success and good fortune, my dear. Happy Birthday!. Today is so special. It’s the day we celebrate your birthday. This is the happiest day of my life. Love you so much. Have a great birthday.. Daughter, watching you grow up has been many things, joyful, impactful, and even stressful. Above all though, it has been the most meaningful part of my life. Happy birthday!. Daughter, you are definitely one special cookie. Emphasis on special. Just kidding, you are adorable, charming, and delightful. You breathe life into my days, and I am so grateful that I have such an incredible daughter.. I thought I knew what love was, and then I had a daughter. It turns out I had no clue how much my capacity for love could grow. I am so fortunate that I have had all these years to get to watch you grow into the lady you are today.. Daughter, I hope you cherish every moment of your childhood. I know that I do. This time we have together now is so dear to me. Even when you are older, you will always have a special place in my heart..
Wishing our precious daughter a happy birthday. You will always be our little sunshine..
You have so many amazing gifts. You are talented and smart. We love you endlessly. Thank you for sharing your birthday with us.. Being a parent is a true privilege that some don’t have. Having a daughter is a special gift. Having you as a daughter is a blessing and an honor. Happy Birthday, from your proud parents..
From father-daughter dances to walking you down the aisle, my time with you has gone by too quickly. You are a truly cherished daughter who will forever remain a little girl in my heart..
You renew my faith in the world because any world that has as incredible a person as you in it is one that can only be good. You are such an inspiration to me, and I hope you feel surrounded by love and warmth on your birthday..
You cannot be successful in life without facing challenges and obstacles. Here’s to conquering all the oppositions in your beautiful life. Dearest daughter, I’m so proud of the person you are. Enjoy your day.. Daughter, you remind me of your birthday cake; you are full of sweetness and sprinkle my life with love. I hope your special day is just as sweet as you are. Happy birthday!. Daughter, you are like a tiny little flower: small, beautiful, and with so much potential. There is nothing I look forward to in life than watching you blossom into a phenomenal person. Happy birthday to my little rose!. You are the biggest achievement in my entire life! You give me something no one else can. Happy Birthday, my wonderful daughter! I will always love you!. Throughout my life, I have received several precious gifts. But you, my dearest daughter, are without the slightest doubt the most precious gift I have been presented with all my life. Happy Birthday to the sweetest daughter in the entire world!. Hope you like my Collection of Beautiful Birthday Wishes For Daughter. Pls, share them with others too.